Beat This Caption Contest 240 Winner – Caption Contest Funny Clever Witty Enter Today! Trust us, our Tenderloins are Dirt-Cheap! 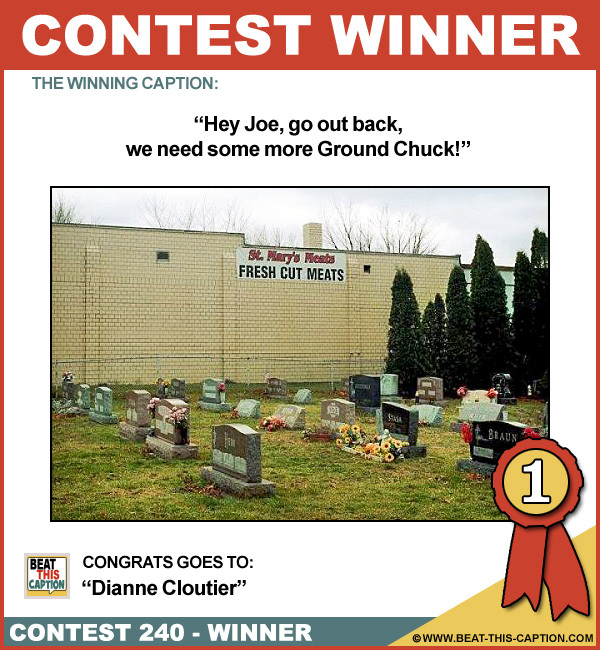 Hey Joe, go out back, we need some more Ground Chuck! HA! Awesome Caption! Made me Laugh! You WIN! All our faithful customers just keep coming back… eventually! …yeah…business has been kinda dead lately! We sell Pepperoni and Sausage for your Tombstone Pizza! Our selection is to die for! When it comes to meats, we have the best slabs anywhere! So that’s why there meat taste a little grainy!